Hurry hard! Do you have a passion for curling? Maybe you’ve never tried it but want to give it a shot? Then join with friends, family and co-workers on Saturday, January 19 at the Acton Curling Club for our Third Annual Charity Bonspiel in support of the CVC foundation. Curl to Connect. Play to Protect. Sweep to Sustain. All proceeds support CVC projects that protect, connect and sustain the Credit River Watershed. Funds help connect communities through initiatives such as the Conservation Youth Corps and building the 100-kilometre long Credit Valley Trail. Last year, our curling bonspiel raised over $3,500. With your help, we’ll top that number this year. The bonspiel takes place Saturday, January 19 at the Acton Curling Club. Curlers of all skill levels are welcome. 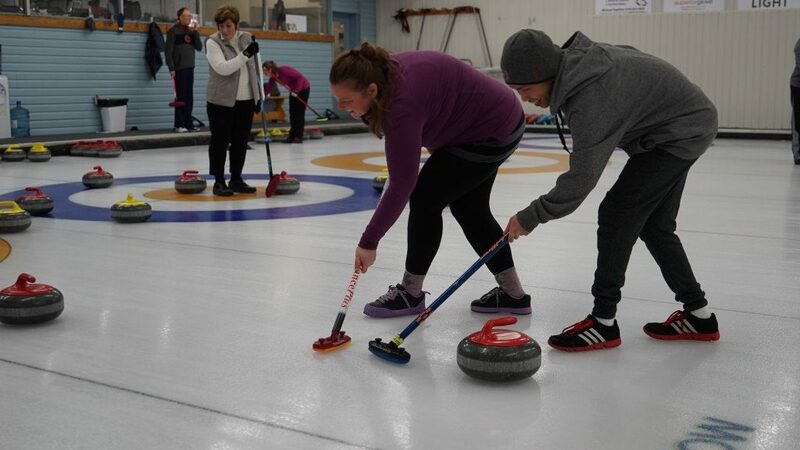 The fun runs from 9:30 a.m. to 4:30 p.m. There’s even an optional “learn to curl” lesson from 8:30 a.m. to 9:30 p.m. for new curlers to learn the ropes before jumping into the game. Register a team of four to play. If you don’t have a team but still want to play, contact CVC’s Julie McManus at julie.mcmanus@cvc.ca before registering. We may be able to find a team for you. This year’s event is 80s themed. We’ll have totally gnarly 80s games during breaks. Be sure to dress to impress. The team with the best 80s-themed costume wins a prize. Take part in trivia contest to test your knowledge about how the environment has changed since the 80s, including in the Credit River watershed. Space is limited. The bonspiel sold out the last two years, so make sure you reserve your spot today. Early bird pricing is just $200 per team and ends November 30. The price then goes up to $240 per team. Registration fee includes lunch and two guaranteed games. Experience the fun and camaraderie of curling and support environmental conservation in your community. Did you know that curling is considered Canada’s ‘unofficial’ winter sport? Curling has been a prominent part of Canada’s history since the game was brought over by Scottish soldiers in the mid-1700s. It wasn’t until 1807 that the Montreal Curling Club formed the first organized curling team, which was also the first sports club ever formed in Canada. Curling is now one of Canada’s most watched and played sports. Curling can be enjoyed by anyone, young and old, from coast to coast.